Since the seam allowances on the black part of the hull were going to be completely covered by other pieces, there was no need to prep the edges. But I did draw the seam allowance on the front of the piece, just to make sure everything was going to line up. I also took the time to baste it to the background just inside the seam allowance. Next, I added the brown top piece. Notice that the left hand edge is not prepped, but all of the other edges are. This next skinny piece is going to go on top those raw edges, but it is going to go under the top brown piece…..
…but at the same time, this little gold piece gets tucked under the top piece. The edge that is not prepped will go under the top piece and the rest will stick out. Needless to say, I had my thinking cap on! So, this is what it looks like so far. As you can see, this skinny brown piece is actually smaller than the seam allowance, so I had to trim just a tiny bit of the black piece before I could stitch it in place. Dicey business! Next, it was time to add the main sail. I stitched the bottom and side edge, and then I basted the raw edge that is going to be covered up…. Everywhere I look, I see a quilt, or a block or a border! Our summer vacation has officially started and we are flying to Nova Scotia to visit friends and family. We arrived in Toronto early so we could spend some time at the Royal York Hotel for breakfast….and some stitching! 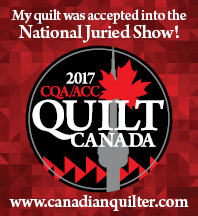 In the lobby alone, I found more quilt designs than I could imagine. This carpet has everything in it that I love, a centre medallion, applique blocks set on point, and an amazing border. Oh, the possibilities! These blocks are actually on the ceiling! A quilter must have had a hand in designing this! And this floor tile reminds me that I would love to make a quilt based on round blocks rather than square blocks!